SIR BRADLEY Wiggins and Chris Froome put themselves through hell for 21 days, covering nearly than 3,500-kilometres and riding continuous for nearly 90 hours each to win their respective titles at the Tour de France. 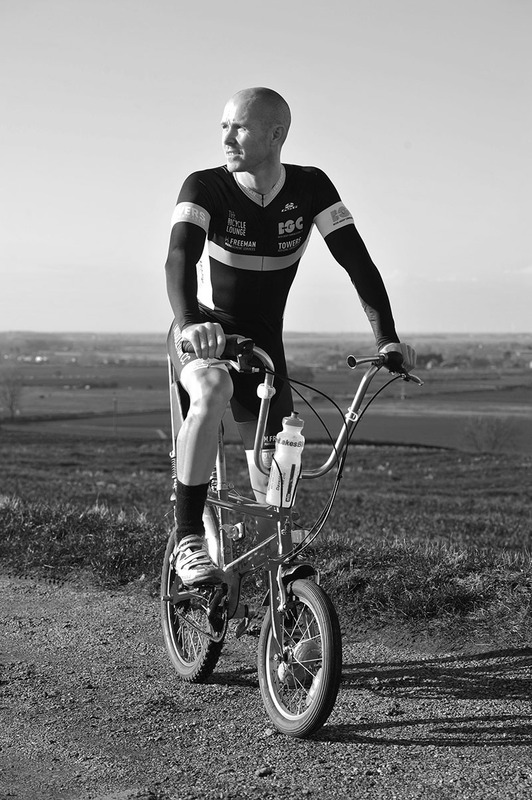 Now a 36-year-old fitness coach from Halsall, near Southport, Merseyside, is looking to go one better by riding the entire 2015 Tour de France route two days before the professionals – only he will be doing it on his trusty Raleigh Chopper, worth just £150. Dave Sims, who runs cycling fitness company Performance Coach, is no stranger to tackling the gruelling mountains of France on his Chopper. 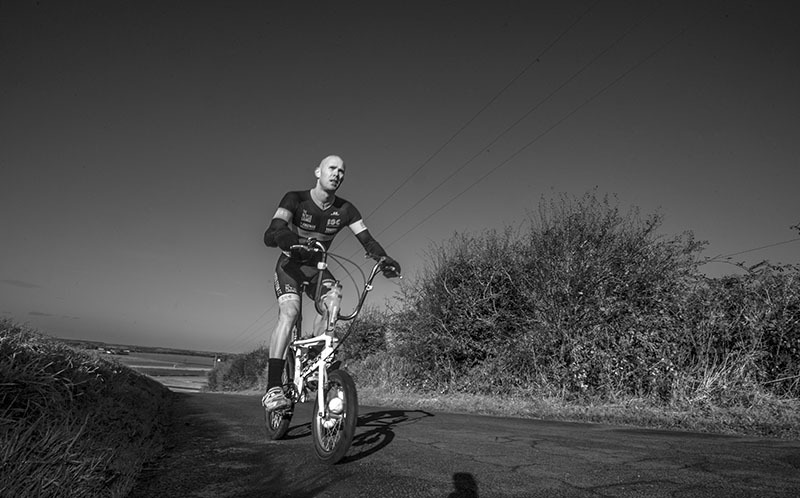 Last year, he completed the L’Etape du Tour – a single stage of the famous Tour de France for amateur cyclists – and even managed to finish in the top 20 per cent with a time of 7hrs 52mins. His epic ride helped raise more than £2,000 for Autism Initiatives and one of the charity’s business ventures based in Ainsdale, MeCycle. 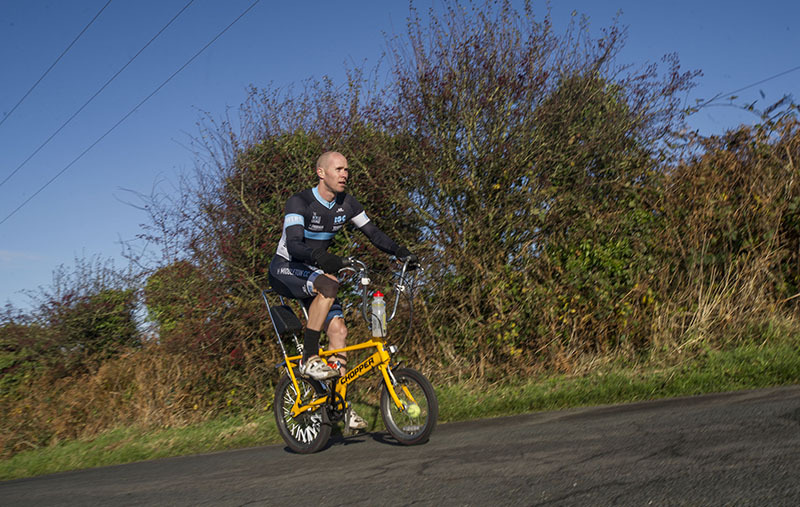 Naturally, he wanted to help raise more money for other charities – this time Help the Heroes – and what better way to do it then jump back on his Chopper and ride the entire route of the Tour de France this July. This year’s Tour starts in Utrecht, Holland, on July 4, before finishing along the Champs-Élysées on July 26. It will cover a total of 3,344-kilometres and include the legendary climb of Alpe d’Huez, with it’s 21 famous hairpin bends. Dave will not be doing it alone, though. He will be joined by sports masseur Mo, bus driver, chef and psychologist Jonathan and mechanic Chris to form his own version of Team Sky – fittingly dubbed ‘Team Chop’. JM: First big question – why a Chopper? DS: I have always trained on my mountain bike and I have always liked to explore different territory, jumping off the road, but the main thing about the mountain bike is that it is heavy and I have always got a lot training-wise from training on a heavy bike. So the Chopper is essentially the next step forward. It has got a smaller rear wheel, it’s heavier, less aerodynamic and it’s the same ethos of trying to make it harder on myself. I saw that video of a guy going up Mont Ventoux on a Chopper and thought ‘why not’. He had a Mark II Chopper and just went up one mountain, so for him it was just a two hour ride. I thought ‘well, if he can do that then I can do three mountains on it’. That’s where it all started. JM: So which mountains did you go up? DS: The Etape du Tour this year was the Tourmalet from the east side – about 12-miles of climbing and the Hautacam to finish off with along with the other lumps and bumps in-between. JM: So how did the Chopper handle? More importantly, how much damage did it do to your legs? DS: Well, it was a case of conditioning myself to being on that bike. The mountains didn’t take it too much out of me because I had a really good mileage over May, June and leading into the Etape. I had the miles in my legs and was down to my lightest bodyweight that I have ever been, which was just under 11st. I think, really, that I just got used to being on the Chopper and learning to ride it efficiently. The bike weights 16-kilos, then add on top of that all the gear on board and me, which is why I had to lose weight. Once you’ve got your bodyweight down and got some miles in your legs, you can get up the mountains – not dead fast, but you can get up them. JM: It must have turned a few heads when you were doing the Etape on the Chopper? DS: Yeah, it did actually. Quite a lot. I got a lot of company over the 7hrs 52mins it took me – almost too much company. As people were chatting to me, I was trying to concentrate going up the Tourmalet in the rain and while trying to get into the zone, but people were just happily chatting to me. The problem with the Chopper’s handling is that because it has a 16-inch front wheel, if I turned to the side to speak to someone then the bike tends to turn that way too. I got a lot of support and there were no egos about – even from some of the roadies that I was overtaking. JM: That was going to be my next question. Did you actually manage to go past anyone on the Chopper? DS: Yeah, I was in the top 20 per cent of climbers that day and I came more than halfway through the field, so I overtook a lot of people that day. JM: I bet they weren’t too happy seeing a guy on a Chopper come whizzing past? DS: To be honest, they were a little bit shocked. At the start, I went out like the clappers so I think everyone thought that by the time that I got to the Tourmalet then my legs would be goosed, but I was actually alright. At the Hautacam, I felt really strong. I hadn’t gone too fast and just keep it steady at about 140bpm the whole ride. I think that everyone who did the Etape last year suffered a bit on the descent down from the Tourmalet. It was pouring down with rain and my brakes didn’t work. With chrome rims, the brakes are terrible. I was going down the Tourmalet with my front brake on continually ready to unclip in case I couldn’t make a corner. So I lost a lot of time on the descents. DS: Well, very good question. I am already training for ‘the’ big event this year, which is the Tour de France. So I am going to do the entire tour, just as the professionals do, so 21 days. I have got a support crew already driving a motor-home and a chef. JM: And you’re planning to do that on the Chopper? Are you planning on doing just a day or the whole actual 2015 Tour route? DS: My Grand Depart will be in Holland on July 2, so I am going to do it two days before the professional, tackling the cobbles first. JM: So, let me get this right, you’re planning on taking on the cobbles, then go right round France before taking on the massive mountains all on a Raleigh Chopper? And not just any Chopper bike, a bloody old one at that? DS: Yeah, that’s a Mark III Chopper, so it has got the same Sturmey Archer hub, an eight speed and a three speed, but everything else is authentic. It even has the same Raleigh tyres it came with – the Red Lion tyres. Everything is the same, but it has got new crank arms on it. I don’t think a Chopper has ever done this sort of journey before. JM: What’s it next? 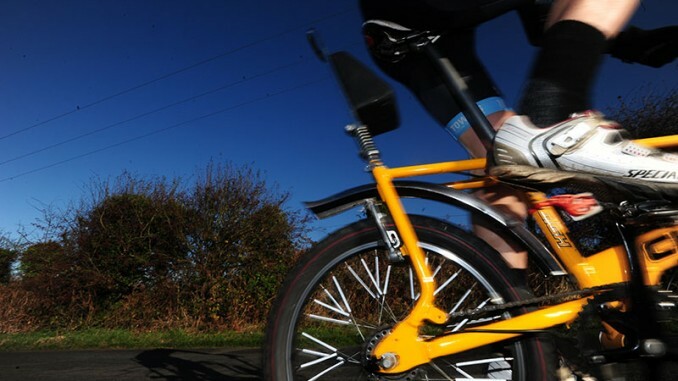 Riding the Tour de France route on an unicycle? DS: Actually, I don’t think anyone has ever done that before either. I have got one in my gym, but I think that I’ll stick to the Chopper for now. JM: So what do you club-mates from H.Middleton’s think about it? DS: They’ve always been used to me coming out on the mountain bike in the A-team or doing the hill climb competition on the mountain bike, too. JM: But you must have gotten a fair few funny comments when you turned up on the first clubrun on your Chopper? DS: I did, yeah. Matt [Middleton] in particular was quite amused. I actually remember the first clubrun, it was the A-team that I went out with and we went straight up Parbold Hill. On our first ride, I just waited patiently in the pack until we crossed over the bridge at the bottom of Parbold, then I decided – just for fun – to launch a Chris Froome attack. Or a suicide attack, as I called it. It was quite funny, as I think everyone had expected to drop me before we got to the foot of the hill, but little did they know how fast that bike could climb and I think that I actually got a personal record up Parbold. In the end, I think that I was about third to the top out of the entire A-team and, after that, no-one was laughing any more.